“On Friday and Saturday it is expected that the increasing pressure over the UK will cause air to become more stagnant with some recirculation of air masses. There is therefore a likelihood of an increase to ‘Moderate’ ozone concentrations on Friday and Saturday, especially across southern England. This Government forecast follows wet and windy weather since the Opening Ceremony and the worst summer smog since 2006 that occurred on the eve of the Olympics. An investigation by ‘Clean Air in London’ (CAL) has found the Government hiding in the smog in the days before the Olympics. The excellent London Air Quality Network (LAQN) has confirmed it was the worst summer smog since July 2006 peaking, in London, on Tuesday 24 July, Wednesday 25 July and Thursday 26 July. The Department for Environment Food and Rural Affairs (Defra) consistently ‘under-predicted’ air pollution levels in the week before the Olympics. Defra failed to forecast a ‘High’ smog episode despite CAL warning of a ‘Perfect storm’ and airTEXT and the LAQN reporting increasingly high actual pollution levels. CAL’s research shows Ministers issuing ‘Press releases’ and making ‘Media appearances’, including at the Olympic Park on Thursday 26 July, which failed to mention the ongoing smog episode. A ‘Pollution Episode Warning’ (PEW) and an ‘information bulletin’ were posted passively on Defra’s website at 16:50 GMT on Wednesday 25 July only after an ‘Information threshold’ under European law had been breached in London. As far as CAL knows, it was the only stakeholder to spot the PEW before CAL alerted the media to it. It seems the only active communication by Environment Ministers or the main Defra Twitter feed (i.e. @DefraGovUK which has some 24,486 followers) during the entire smog episode was to retweet a tweet from @DefraUKAir (which has some 199 followers) which stated “Nowcast Fri 1pm: Low air pollution measured across all regions of the UK”. CAL emphasis. In CAL’s carefully considered opinion, Defra misled the public by giving the impression air pollution was ‘Low’ (i.e. 1/10 to 3/10) on Friday 27 July when its website was forecasting ‘High’ 7/10 ozone for London for the 24 hours up to 15:00 on Friday 27 July and then ‘Moderate’ 4/10 ozone for London for the following 24 hours to 15:00 on Saturday 28 July. Worse, the Government’s message clashed with excellent articles by the media which were responsibly alerting the public to the smog. Note: a Freedom of Information request by CAL found that a ‘Press release’ about air pollution issued by Defra in April 2011 had received more than 17 times the number of webpage views of an ‘information bulletin’ about air pollution posted in April 2012. Environment Ministers issued a ‘Press release’ on 24 July launching a consultation on a new set of Sustainable Development Indicators (SDIs) for Government that downgraded (wrongly) ‘Air quality’ from being included in several of 68 existing departmental indicators to a new ‘Tier 2 comprising 25 supplementary indicators’. The following day, Ministers issued a ‘Press release’ launching a consultation titled ‘Guidance for Business on Environmental Key Performance Indicators’ that (rightly) identified ‘Air pollution and other emissions’ as the first of five environmental Key Performance Indicators for companies. The second ‘Press release’ stated that the aim of the revised guidance is to provide ‘clear advice to companies on how to measure and report on their environmental performance using environmental key performance indicators (KPIs); help determine which KPIs are most relevant to an organisation; and set out the rationale for managing environmental performance using KPIs’. In separate but related news, Defra has written to Jenny Jones AM (Green Party), Deputy Chair of the London Assembly’s Health and Environment Committee, denying the relevance of the air pollution monitor in Neasden Lane in Brent for legal reporting purposes. That monitor has reported the highest recorded levels of dangerous airborne particles (PM10) in London in 2011 and so far in 2012. “Regrettably, memories of London in 2012 will include the worst smog since 2006. There have already been some 200 news items around the world about smog and the London Olympics. “Ministers most responsible for warning the public of air pollution failed to predict a ‘summer smog’ despite warnings from Clean Air in London and others. “Worse, Ministers were either asleep on the job or chose not to warn the public about the worst summer smog since July 2006 on the eve of the Olympics. “Detailed investigations by Clean Air in London show that Ministers were putting out ‘Press releases’ and making ‘Media appearances’, including at the Olympic Park, which failed to mention the ongoing smog episode. A ‘Pollution Episode Warning’ (PEW) and an ‘information bulletin’ were posted passively on the Government’s website only after an ‘Information threshold’ under European law had been breached in London. As far as CAL knows, it was the only stakeholder to spot the PEW before CAL alerted the media to it. “Clean Air in London has also found Ministers setting double standards, proposing during the smog episode (wrongly) to downgrade ‘Air quality’ as a Government performance indicator while (rightly) recommending it as the first of five environmental Key Performance Indicators for companies. “No other Government in the world would issue a ‘Press release’ announcing it was downgrading ‘Air quality’ as a Government priority on the day it should have been issuing a ‘Press release’ to warn the public of the worst summer smog for six years. risk worsening smog again as London heads for a second (lesser) smog episode later this week. “The Mayor should have banned the most-polluting diesel vehicles and ‘encouraged’ the less-polluting 70% of vehicles to drive into London – as CAL has urged since 2008. “The Mayor should build on his new pledge ‘Improving air quality in London is one of the most important challenges I face as Mayor’ by acting personally to protect athletes, visitors and Londoners after the Government has failed to do so. Clean Air in London has written to Defra expressing ‘grave concerns’ about its failures to warn the public about air pollution. The excellent London Air Quality Network has confirmed ‘High’ ozone was measured at several sites in London, Kent and Sussex on Wednesday 25 July, and ‘High’ was again measured at one site in Sussex on Thursday 26 July. ‘Moderate’ ozone was measured across London, Kent, Essex, Sussex, Surrey and Berkshire. A new ‘Tier 1 comprising 12 headline indicators’ is proposed by Environment Ministers, that excludes air quality, which are ‘high-level outcome measures and capture priority issues for making economic, environmental and social progress for this and future generations’. Annual emissions of oxides of nitrogen, particulate matter and sulphur oxides in tonnes were identified as outputs to calculate and report. Other emissions included Acid and Organic Chemicals, Nutrients and organic pollutants, Volatile organic compounds (VOCs) and Metal emissions. In related news, Defra has written to Jenny Jones AM (Green Party), Deputy Chair of the London Assembly’s Health and Environment Committee, denying the relevance of the air pollution monitor in Neasden Lane in Brent for legal reporting purposes. 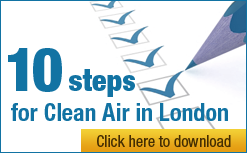 The Neasden Lane monitor reported the highest levels of air pollution in London in 2011 (i.e. 77 in 12 months) and so far in 2012 (i.e. 54 in the year to date), far exceeding the 35 Bad Air Day’s allowed under UK and European law.